Last week I went on a virtual holiday, courtesy of Sharp’s Brewery who billed it as an In-flight Beer Experience. We didn’t fly very far – in fact we didn’t move at all – but there was indeed beer along the way. 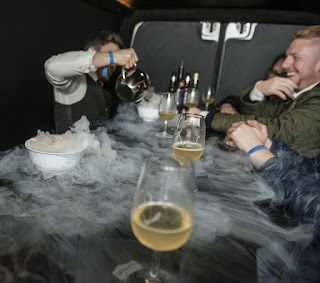 The most interesting part, though, was that it physically demonstrated a bunch of things that even trained beer-tasters normally only talk about. 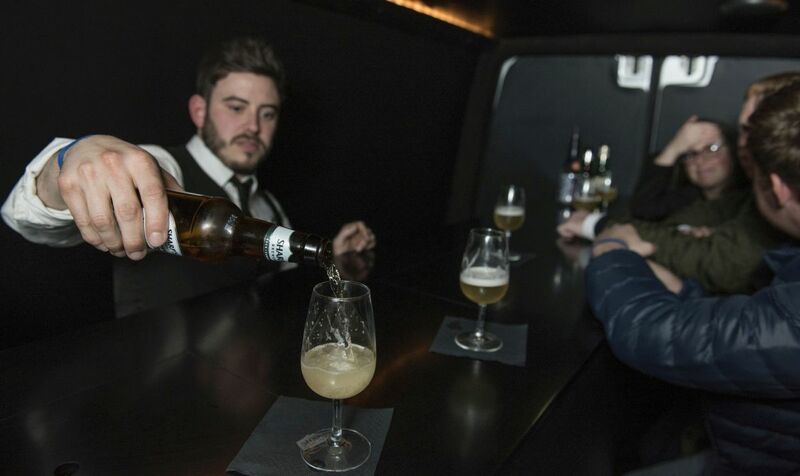 Our barman, Sharp’s beer sommelier Sam, fed us three beers in turn, asking us to say what we thought. They seemed pretty different but he then revealed they were all Pilsners – and two of them were the same beer, Sharp’s Cornish Pils! He had used a wide mix of sensory inputs to trick our senses into perceiving them differently – the sound of the seaside for one of them, subtly adding grapefruit aroma into the air for another, and the mood lighting kept changing colour. It was really well done. I was aware of the coloured mood lighting, but only because it made it so hard to judge the colours of the beers. I didn't spot the smells, and being unable to go back and re-taste beer #1 later, as you would do when judging, made it impossible to compensate for how each successive drink coloured your whole palate. At the end, and after explaining some of what had happened, he poured us a last drink – a cocktail of a splash of a gin sour in some more Pils. Initially there was just a tart lemony-herbal edge to the drink, but then he poured a liquid containing orange oils over some dry ice (!) to flood the space with aroma. Now the drink tasted more citrusy, and even orangey. So what was the lesson? Well, when you learn to taste and judge beer, one of the things you’re warned about – but rarely experience so clearly in reality – is that your sense of taste can be affected by all sorts of external factors such as background smells, lighting, even the seating, as well as by spicy food or what you were drinking before – and just before starting the experiment a friend had passed me a neat Glenfiddich, aged in an IPA barrel... No wonder the first Pils had tasted so light! We also got to try Sharp’s excellent Camel Valley Pilsner, which is a collaboration with Cornwall’s largest vineyard, Camel Valley. It’s the regular Pils refermented with Champagne yeast in the classic Methode Champenoise, and it’s lovely, with a thicker body, an orange note, and a hint of farmhouse ale, the refermentation also pushes the ABV up by 1%. The first batch is almost gone, but I was glad to hear there’s a second, much larger one, on the way! If you ever get the chance to go on one of these Sharp’s tasting events, I’d highly recommend it. They are not all the same – they change the themes around and have multiple beer sommeliers hosting them, so even if you’re offered the In-flight Experience it will most likely be different to mine.